Osaka City Air Terminal (OCAT) is a multi-purpose commercial complex in Minatomachi, Naniwa-ku, Osaka housing South Osaka's inter-city bus terminal and coach ferry services to Kansai International Airport, JR Namba station and six floors of shops, restaurants, travel agencies and tourist offices. 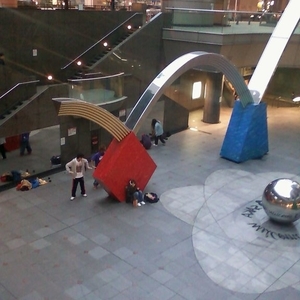 OCAT is also the venue for frequent musical performances and its outdoor Ponte Square area is the meeting place and practice area for Osaka's youthful street dance community. Urban dance competitions are held there every August. Despite the name of the complex, OCAT is not actually an air terminal itself but part of an extended, inter-connected underground transport hub to Kansai International Airport. Namba Station, the terminal for south Osaka City bound train services (including Kansai International) is within 15 minutes walking distance from OCAT via the Namba Walk - an underground passageway lined with shops, bars and restaurants. Here's the our members favorite photos of "Key Buildings near Naniwa-ku". Upload your photo of Osaka City Air Terminal! Companydoctor1- Branch is the only Touristlink member to visit Osaka City Air Terminal. Have you been here? Click here to save it.